A couple of beautiful roast packages, ready to rest for 24 hours! 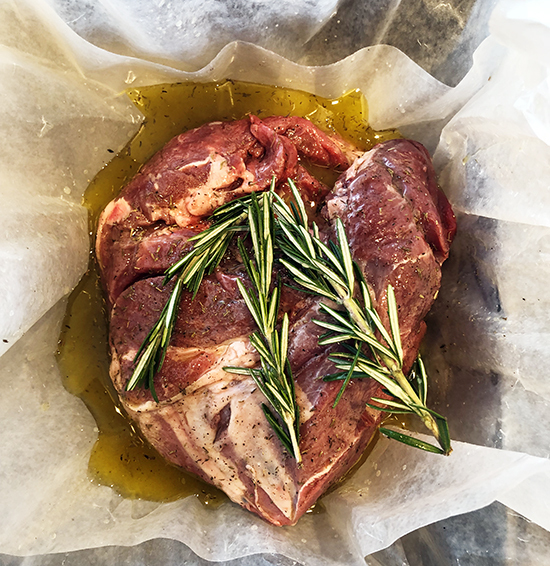 • Rub the roast with the juice of 1/2 a lemon, 1/3 cup olive oil, salt, pepper, thyme, and rosemary on all sides. 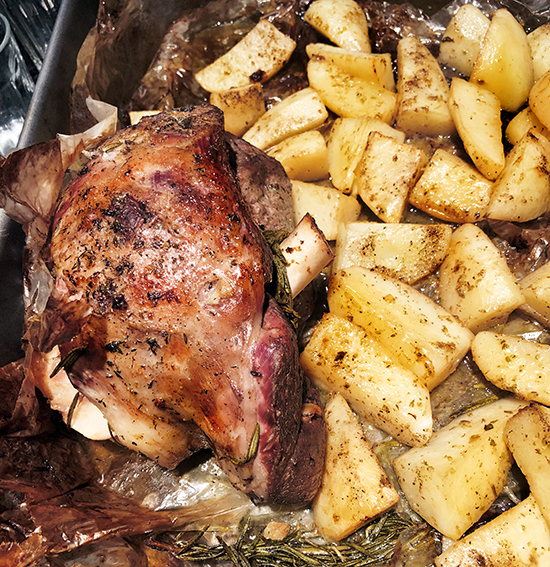 • Place the roast on top of two large (14+ inches wide) rectangles of parchment paper. Begin gathering the excess paper on the sides together, creating a reservoir for the remaining liquid —pour in the remaining lemon juice, olive oil, and wine. 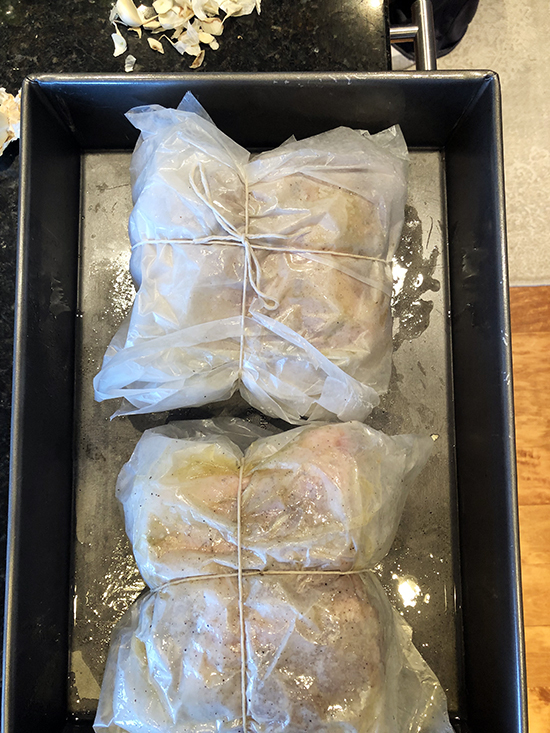 • Tie the parchment square closed with kitchen twine, and refrigerate up to 24 hours. • Place the roast, still tied in parchment, onto a shallow roasting pan or sheet. Roast for 30 minutes. • Decrease the temperature to 350ºF and cook for an additional 2 hours. 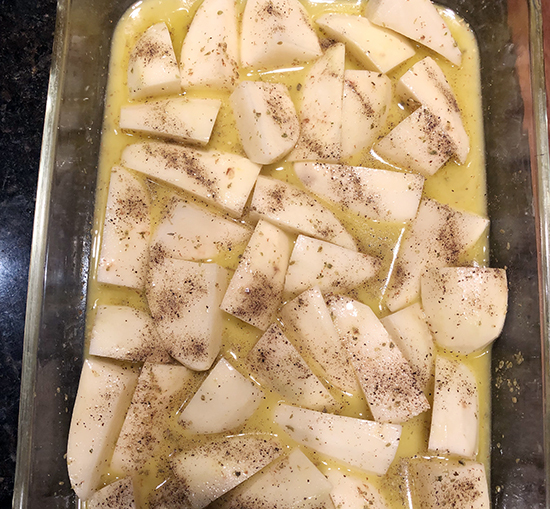 • Meanwhile, cut potatoes into eighths, and season with salt & pepper. Place in shallow roasting pan. • Combine lemon juice, mustard, and olive oil, mixing until smooth. Thoroughly coat potatoes in lemon & olive oil mixture, and cover with aluminum foil. • After 2 hours at 350ºF, remove the roast, and carefully open the parchment, reserving as much of the liquid as possible. Combine the partially cooked potatoes, the liquid, and the lamb, and return to the oven for another 20-30 minutes, or when the lamb and potatoes are golden brown.